Let's Integrate Math and Science4Us! Science all by itself can be quite an interesting topic, but when it’s taught without other subjects, especially in kindergarten, 1st grade and 2nd grade, students are missing out on the bigger picture. The best way to teach science is by adding in the interdisciplinary components of technology, engineering and especially math (STEM). 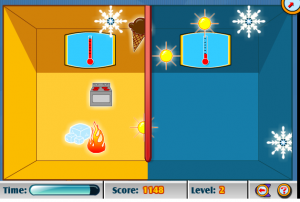 The Science4Us lesson plans integrate Common Core math concepts throughout its 28 instructional modules. For example, in the module, Science Tools, young learners use resources such as rulers, graduated cylinders, and balances both in digital and hands on formats to make measurements, count objects and describe objects in terms of their mass and volume. 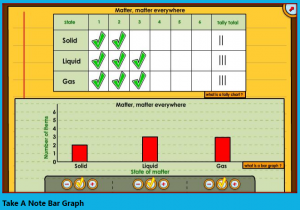 In the States of Matter module, students investigate matter using a particle viewer and then create a tally chart. They will then count the tallies and design a bar graph to show their results. This allows kindergarten, 1st grade and 2nd grade students to not only organize information, but also represent it and interpret the data collected. From this, students can answer questions and even expand their scientific thinking to a higher level and ask new questions. Science4Us not only incorporates math common core concepts but weaves in literacy too. 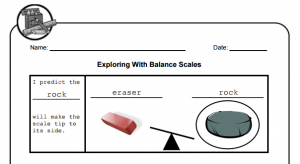 By infusing multiple topics, early elementary teachers can save time and accomplish more!